exas Rangers outfielder Shin-Soo Choo talks to the media after being introduced at a press conference at Texas Rangers Ballpark. Shin-Soo Choo has officially joined the Texas Rangers, a team that went into this offseason looking to remake its offense. The 31-year-old South Korean was introduced Friday, and general manager Jon Daniels called him a "right fit" for the club. 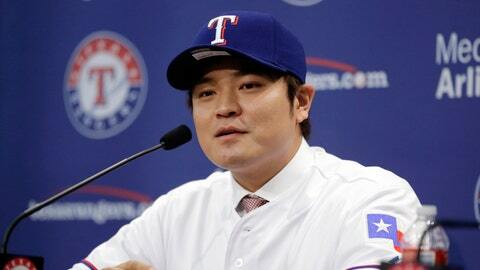 Choo received a $130 million, seven-year contract. That deal was agreed upon last weekend, pending the completion of a physical. He has a .288 career average and .389 on-base percentage in 853 major league games for Seattle (2005-06), Cleveland (2006-12) and Cincinnati. He has at least 20 homers and 20 stolen bases three times, including last season when he started 150 games in center field and was the primary leadoff hitter for the Reds in his only year there.